Check out this video to see how we are using some items that we have around the house to organize all of those little "things" you collect in a shop. I think I have about 1 million screws, nails, staples, bolts, nuts, washers, fittings, wire nuts, wire, and other random items in my shop that don't really have a home. They tend to sit in a bucket here, a bin there, or a toolbox. One of the most frustrating things that seems to happen to me too often is not being able to find what I need while in the midst of a project. It seems that I wonder around looking for my tools, fittings, screws, and nails for about just as much time as it takes to complete the whole project in the first place! Many years ago we rented a house from an older gentleman and in the garage he had all of these glass jars hanging from the ceiling. Each jar was filled with a type of screw, nail, nut, bolt, or other item and it was very easy to find what was needed. 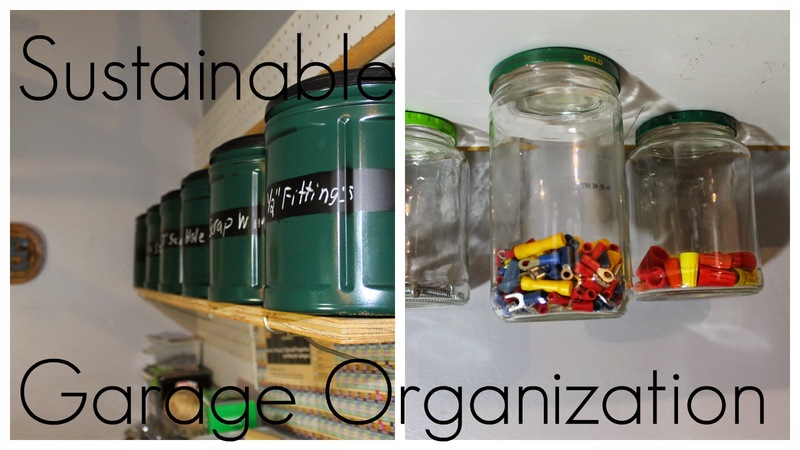 I wanted to mimic this here on the suburban homestead and use this idea to organize some of my random "things". I also have been sing some old plastic coffee containers to store some of my larger items for awhile and this has also been working very well. I just need to make them look a little bit more like organizers and less like old coffee cans! As I try to get a proper shop setup here in my corner of the garage I have two main goals, make things easy to find and get that reassuring ok from my wife when it comes to aesthetics:) So it is time to turn these old coffee containers into something that looks a little bit nicer and functions better as well. I am using the plastic coffee containers from Folgers coffee that were purchased at Walmart. If you purchase this brand at Sam's Club you will get an even larger container but I found the Walmart size fits nicely here. The jars that I am using for the smaller items are some pickle jars and some salsa jars. You can use whatever type you normally purchase, just start saving them each week until you have enough to get started. It took us a couple of months to get the jars I am using here and probably about a year to save the coffee containers. If you don't drink coffee ask a friend or family to save them or look for other options in your home. This was a very easy project and I am very happy with the result. The larger containers are very easy to label and re-label as needed and hold a perfect amount of small fittings, tools, or other "stuff". The glass jars will take me a bit to fill as I still have a pile of "things" to sort, but they are a perfect way to be able to see those items and easily grab a jar and get what you need. Grab your chalkboard paint here. I love this, I have big plans for 2015 that include organizing/minimizing all my stuff! Definitely adding the garage to my list of plans! Thanks for sharing at the Homestead Blog Hop!